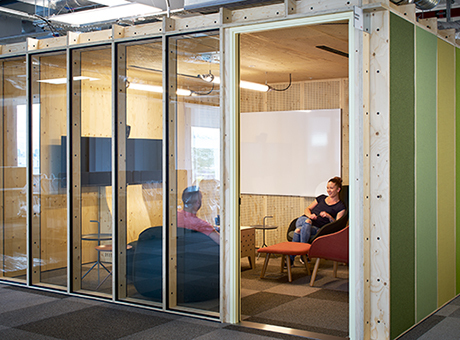 Dr Kerstin Sailer, a Reader in Social and Spatial Networks at UCL's Bartlett School of Architecture, has been invited by Google to carry out a 5-month research project entitled 'Flexible Spaces: Changing Office Configurations'. The project is scheduled to finish in March 2017 and aims to analyse the performance of a new modular meeting room system called 'Jack' developed by Bartlett alumni at Allford Hall Monaghan Morris. A total of 160 Jacks will be installed in Google’s London HQ with prototypes being sent to other international Google offices. Each unit is built from wooden cassettes and comes with a ‘Jack Manual’ with the idea that members of staff can be trained to assemble them together to promote teamwork and collaboration. Having explored the impact of spatial design on people and social behaviours within a range of buildings in the office, education and health sectors, Dr Sailer will now investigate the social and organisational effects of the Jacks, examining how movable and practical the units are in different scenarios. The project is conceived against the background of increasingly fast-paced changing business environments and work processes, where the physical office environment struggles to keep up. "The very idea of architecture is permanence," explains Dr Sailer, "this creates a dilemma for contemporary workspace design because as teams grow and shrink, accept new responsibilities and launch new products or services, they require different office spaces regularly." Therefore, Jack has the potential to provide a solution for a more manageable and flexible workspace. Dr Kerstin Sailer’s research profile. Details of Dr Kerstin Sailer’s project proposal can be found on the AHMM Website.